Studies have shown that over 90% of people with a lumbar disc herniation that were treated with chiropractic care improved within 3 months, and 88% improved within 1 year. Perhaps even more impressive was another study, which indicated that, for disc herniations in the neck, 86% of people found relief with Chiropractic care compared with less the 50% of people who underwent a spinal injection. We continue to learn that, most of the time, the benefits of medications, injections, and surgery just don’t outweigh the risks. 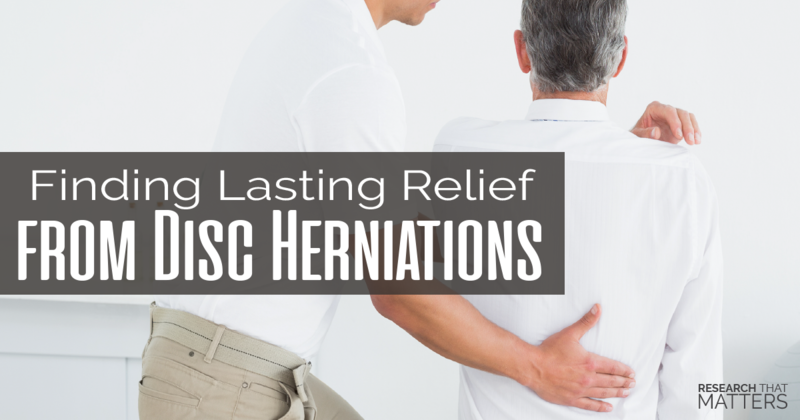 In a recent study, researchers found that over 90% of patients with a lumbar disc herniation improved within the first 3 months of receiving Chiropractic care. Over 35% more people with cervical disc herniations found relief with Chiropractic care than with spinal injections. Discovering the most up-to-date Research That Matters is part of our practice. We focus on using this research and combining it with our clinical expertise and experience to provide you with the best care possible. So, if you are suffering from a disc injury, please know that you’re in the right place, and we are grateful you are trusting us with your recovery.